CHARLOTTE, North Carolina (WTVD) -- No Cam, no Luuuke, no victory. 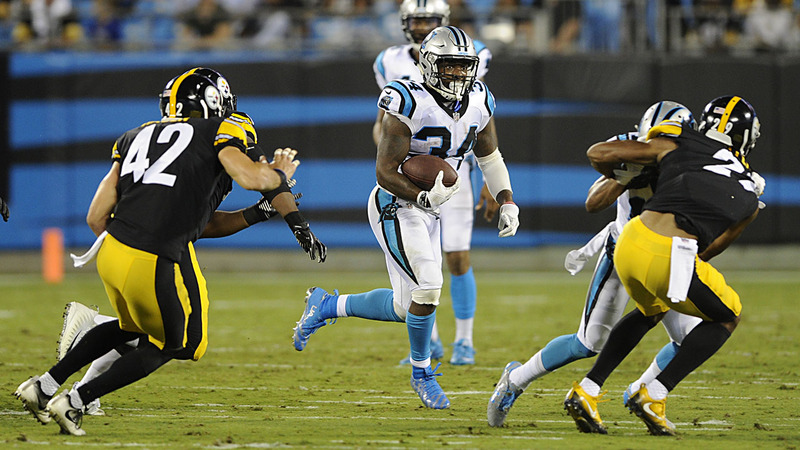 Though the Carolina Panthers led most of the night Thursday, the Pittsburgh Steelers rallied to score with nine seconds left and sneak out of Charlotte with a 17-14 victory. In what's traditionally regarded as the most meaningless of the four preseason games, Panthers head coach Ron Rivera kept both the first-team offense and defense on the bench along with rookie Christian McCaffrey. The second-team guys would put Carolina on the board first. In the first quarter, Panthers cornerback Teddy Williams blitzed and got pressure on Steelers quarterback Landry Jones, who then threw a jump ball. David Mayo came down with the interception, and soon Fozzy Whittaker punched it in on a short run for a 7-0 lead. One of the standouts this summer has been Cameron Artis-Payne. The third-year pro out of Auburn rumbled for 35 yards on another highly productive night. The "other" Cam finished with 51 yards on eight carries. He did have a drop, which is one of the reasons he isn't higher on the depth chart already. The Panthers took the lead late in the half on a Joe Webb-to-Damiere Byrd 13-yard touchdown pass. For those clamoring for Webb to replace Derek Anderson as the teams backup QB, Webb threw two interceptions including a terrible decision early in the second half to set Pittsburgh up deep in Carolina territory. Cut day is Saturday, and the Panthers will trim the roster from 90 to 53. Then it's on to San Francisco for the season opener on Sept. 10.